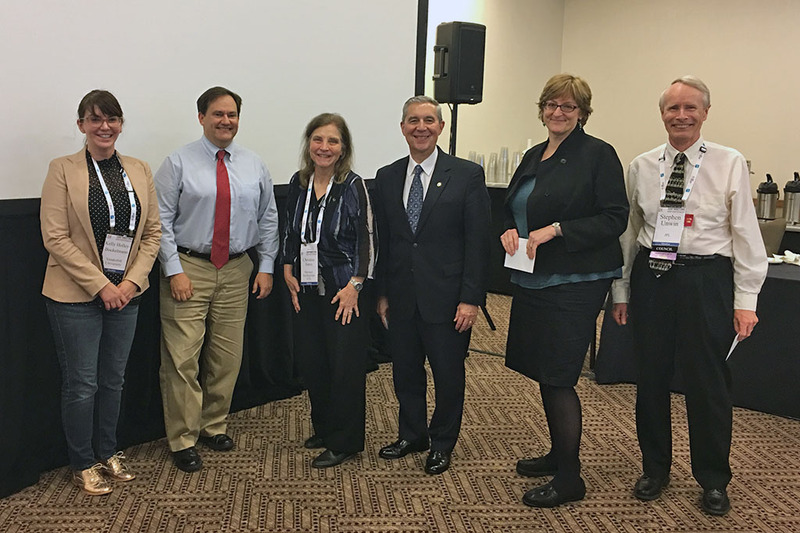 The AAS Council and President Christine Jones thanked our outgoing Officers and Councilors for their service to the Society by recognizing them at the Council meeting in Austin. As they ended their terms, they returned their Handbook of Non-Profit Governance Best Practices and received in return an engraved nameplate with their position and the mission of the AAS emblazoned on the opposite side. Shown in the photo (l to r) are Kelly Holley-Bockelmann (outgoing Councilor), Buell Jannuzi (outgoing Councilor), Christine Jones (President), Jack Burns (outgoing Vice-President), Meg Urry (outgoing Past President), and Stephen Unwin (outgoing Councilor). The Society thanks them for their dedicated service. Only through engaged volunteer leadership can the Society move forward. New Council members took up their duties in Austin: Megan Donahue (President-Elect), Michael Strauss (Vice-President), Marcel Agüeros (Councilor), Kelle Cruz (Councilor) and Kelsey Johnson (Councilor). We welcome them aboard and look forward to working with them to achieve the AAS's goals.